Ken Armstrong Writing Stuff: Is there a Dr. Marten in the House? One of my most-treasured idiosyncrasies is that I only ever own one pair of shoes at a time. I polish them up for posh occasions and wear work boots and wellies whenever the going gets really tough and so my solitary pair of shoes last me a good long time. When I get my new shoes, I put the old ones in the bin and walk away. I always wear the same brand of shoes. Dr. Martens Classic 1462 – Black – three eyelets – absolutely no yellow stitching. It’s a great shoe and, no, this is not a sponsored link. Last week when my newest-of-the-new shoes arrived, I started wondering how I had ever become so attached to this particular shoe and the wondering took me back to my first encounter with a Doc Marten shoe. I think I had actually blocked this painful and stupid memory from my brain. Anyway, here it is, in all its truth and inanity. Christmas, 1987, my new girl would be expecting a nice Christmas present. She’s my wife now and some things don’t ever change. Anyway, hints had been dropped about a nice pair of brown Doc Marten shoes which could be found in the famous ‘Shelleys’ shoe shop in Sloane Square, London. We lived in London then so it wasn’t, like, a ferry trip across the Irish Sea or anything. So I went to Shelley’s - a great shop - ('still not a sponsored link) and bought the shoes off a very nice girl behind a very nice oaken wood counter. The girl gave me two receipts – I think that’s what threw me. One receipt, I can handle but two? I needed to keep the receipt… receipts… in case the shoes didn’t fit (or fitted an ugly step-sister, or something) but how the hell do I deal with two receipts? There was a stapler lying on the nice-girls counter. Not just any stapler. A powerful, silver, staple-gun-type-thingie. In a flash, I had it – I would staple the two receipts together, for safe keeping. After politely asking "May I?" I placed the two receipts on the polished hardwood Sloane Square counter and lined the gun up to staple them together. What had I been thinking? This powerful staple gun had no ‘back’ on it – no platform for the staple to be pushed into. The staple – and my two receipts - would be embedded into the wonderful oaken-wood countertop. Much embarrassment would undoubtedly ensue. I smiled winningly at the girl. Then I quickly (it had to be quick) picked up the two receipts and aligned them both along the outside edge of my index finger. Then, drawing back, I fired a single thick stainless steel staple through the two receipts and on into the soft depths of my digit. The girl behind the preserved oaken wood counter recoiled in horror. What was this guy? A suicide-by-staple-gun fanatic or something? For my own part, I panicked, screamed then danced around a little – my receipts fluttering gently in the air. The whole shop stood and watched. In an attempt to regain control of the situation, I slipped my finger nail under the end of the fully-embedded staple and pulled it out. It hadn’t folded over on itself inside my flesh – which was kind of good. The staple was followed out of my finger by the mother-and-father of all blood-gushers. I grabbed a tissue off the pristine oak counter (in retrospect, what a well-equipped counter that was), wrapped up my finger, apologised and simultaneously bled profusely, then left. My finger swelled up like a big swollen up thingie and bled weepingly for most of that day. My wife-to-be loved the shoes and the blood stained receipt from Shelleys is now a treasured family heirloom. And from that time on, I have worn only Dr. Martens shoes. That was painful to read :) I don't think there is any greater pain than to injure a finger or toe! Great blog! Actually back in the day it was Brutus Gold with me. I'd wear one pair out and replace them with the exact same pair. They used to turn my legs blue. I've never owned a pair of Doc Martins. Not even the boots which would probably have gone well with the Brutus Golds. Nowadays I buy my shoes from Clarks because I have extra wide feet and don't care about style. Brutus Gold, eh? Maybe it's time I had an alternative pair? And May, 'masculine' eh? You got that right missus!! :) Good luck with new blog, hope i can find you. And Ash, glad it was painful, that was partly the intent. Haven't worn any of my pair of Docs in ages. I need to get them out of the cupboard. On a slightly side note, how do you make do with one pair of shoes? I know it's explained in the article, but I've got (mentally counting white flats, red flats, red heels, red low heels, black Converse, green Converse, white sneakers, grey heels, brown boots) at least nine pairs. At least. And I don't even consider myself a shoe person, truly I don't. Wow. I totally don't care about having stuff in my teeth last night after reading that tale. :) Thanks for being humble enough to share. lol, just as well they fit her ok and you didn't have to take them back. Huh? You didn't....I have mixed feelings...disbelief and empathy... you believe I have read 3 -yes, three of your posts? The first time I did that...basically, I just browse...anyway, keep posting..you recount these personal experiences of yours so well. Happy blogging. See, that's the key question, Chica,isn't it? What on earth possessed me to do it? The truth is, it was just one of those lightning-fast acts of random stupidity that happens sometimes when you're in an awkward, unfamiliar situation. Ken, you make some very strange decisions (re the receipts and stapler...). They make for good stories though. Hi Rachel: I had what I thought was a great idea then didn't think out the repercussions quite thoroughly enough... it's a lesson I haven't yet fully learned. Man, I don't want to be around if you ever have need of a nail gun. sorry Ken, did you say something after one pair of shoes? I just can't wrap my head around that thought. That made me laugh. 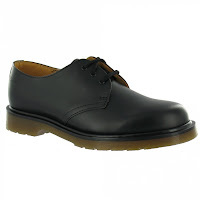 And reminisce about how every male friend back then had Dr. Martens, except my Irish boyfriend who couldn't get a size big enough to fit his enormous feet. I think it has left him scarred for life. Young Balally Players go boy-racing in April.